I absolutely loved this hostel. We arrived at 15h and could check in immediately. The welcome was warm and the entrance and lobby looked really cool (table football, bar, pool table). I stayed with 3 friends and we booked a private 4 person room. It was all we needed, clean bathroom, comfortable beds and spacious room. The WiFi connection was great even in the 5th Floor. Best of all: Location! 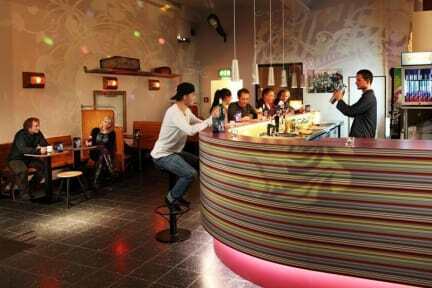 In the heart of friedrichsrain close to the station and to many small bars and boutique stores! Heel fijn en schoon hostel met super goede bedden op een hele goede locatie. Wel last gehad van luidruchtige kamergenoten die op de kamer een feestje wilden bouwen..dat was minder. Oordoppen zijn geen overbodige luxe, vooral als je aan de straatkant slaapt :) meer stopcontacten op de kamer zou overigens fijn zijn geweest. The facilities like rooms, showers and location are very good. Staff is friendly. However it is a very big hostel. So it depends on the individuell needs. I travelled on my own. It was harder to meet people compared to other hostels i stayed at. There were also around 2 school clases with kids. But they left on friday. Because of that i would only stay there on the weekend. Very big Hostel, what is not good for a solo traveler. A lot of group (180 schoolchildren checked in after my arrival). Nobody made use of the common area due to the lag of social travelers. facilities and rooms were ''okay'', but It more felt like a hostel factory. Won't go back. This hostel really felt like a big sleeping factory. Nothing really fun or cosy about the place. The people who worked here were nice and the location was great, very close to transportation and in a good neighborhood. The rooms were very impersonal, and it looked liked they only get a good clean once every few months. A lot of dust allover The shower was like a jet beam with a stream for only a minute and then you have to push the button again. There are better, cheaper hostels in Berlin.